Here Ashraf addresses the congregation at the end of his ordination service on Sunday afternoon at Jerusalem’s Lutheran church of the Redeemer. 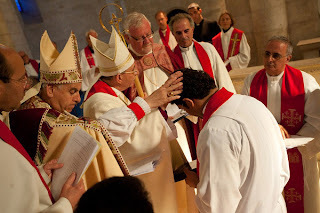 One of the highlights of my former life as a college religion professor was the opportunity to take part in ordinations of former students—several each year. 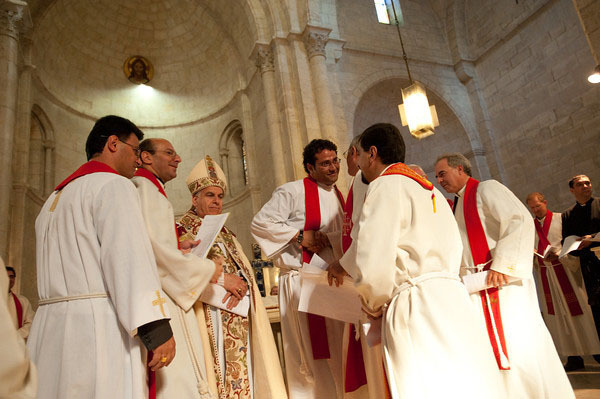 The ELCJHL is such a small church that ordinations are few and far between— seven Palestinian pastors and a bishop. The last ordinations were in March 2008 when Pastors Saliba Rishmawi and Imad Haddad entered the holy ministry--and so they were given the honor of leading our procession on Sunday. Ashraf's ordination was an occasion for great celebration and jubilation for the local church—small as it may be—with our Palestinian pastors congratulating Ashraf as he rises from the kneeler upon the declaration of ordination. That declaration was pronounced by Bishop Munib A. Younan with the Palestinian pastors leading the Arabic liturgy. Yet the larger church community was present to accompany the ELCJHL on this occasion. 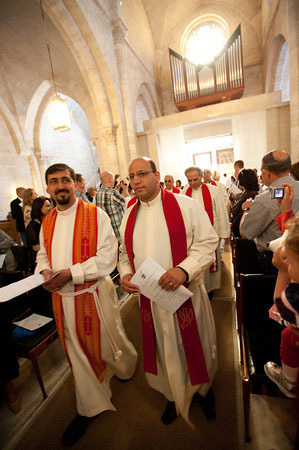 Jerusalem’s Anglican Bishop Suheil Dawani and the Lutheran Bishop of Oslo, Norway, Ole Christian Kvarme, assisted. 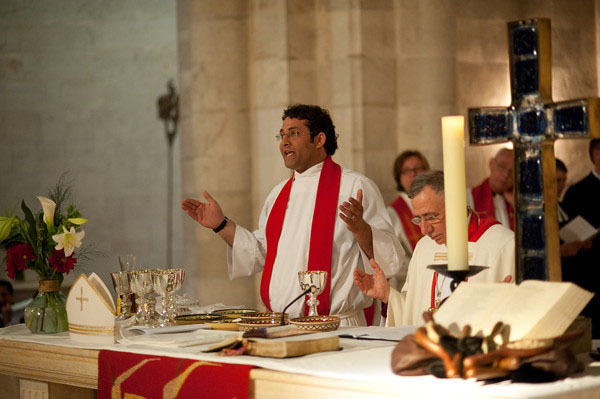 Accompanied also by representatives of Jerusalem’s churches offering their prayers. Accompanied by representatives of the ELCJHL’s international partners sharing a word of Scripture. 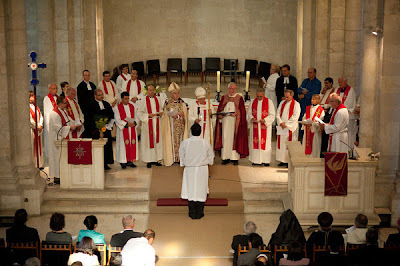 Accompanied by the ELCJHL’s expatriate clergy standing in the background in a supportive role. Accompaniment is a key word in our understanding of today’s global mission, as we the global church walk along with the local church contextualized in theology and worship. I am mindful that today, as we are writing this blog, marks the 37th anniversary of my own ordination at Messiah Lutheran Church in the small town of Wabag in the highlands of Papua New Guinea. While ordinations are often held in a candidate’s home congregation with family and friends present, our mission agency called one day to ask if we would consider postponing ordination until after arrival in PNG where I was ordained not by a bishop of the sending church, but by the bishop in Papua New Guinea. It would be a sign of this new understanding of the emerging local churches and the accompanying role of missionaries. 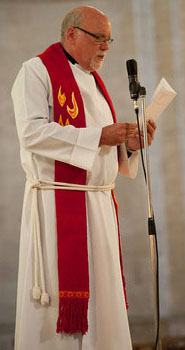 Yes, the red stole I wore Sunday was the one Gloria handmade for me 37 years ago in the highlands of PNG where we learned to serve the local church as we walked together in mission in that particular context. And here in the city where the Christian Church was born and from which missionaries went out to the four corners of the world, Ashraf continues an unbroken chain of two millennia of ministers of the Gospel. 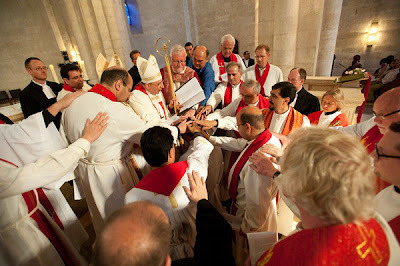 This is our favorite photo from the ordination. As a symbolic gesture of our understanding of accompaniment, we the clergy from the Global Church formed an outer circle laying our hands upon the shoulders of the pastors and bishop of the ELCJHL who form an inner circle laying hands on the kneeling Ashraf Tannous. And now it is our privilege to serve alongside Ashraf in ministry in this place. Ashraf grew up in the West Bank city of Ramallah where his parents came as refugees during the 1948 war. 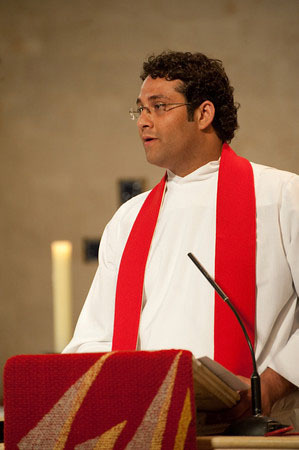 He is a graduate of the Lutheran School of Hope in Ramallah, the Near Eastern School of Theology in Beirut, Lebanon, and graduate school in Geneva, Switzerland. We got to know Ashraf two years ago while he served as Vicar of the Arabic congregation here at Redeemer. He spent a second year of internship this past year in Germany. Fluent in Arabic, German, and English, Ashraf brings many gifts and lots of energy to ministry and will be an asset to the church. 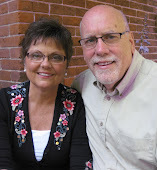 Fred & Gloria served from July 2010 to December 2012 as ELCA Global Mission personnel in Jerusalem where Fred was Pastor of the English speaking Congregation at the Lutheran Church of the Redeemer in the heart of the Old City and also Special Assistant to Bishop Munib Younan of the ELCJHL. The name Walk in Jerusalem is related to our understanding of Global Mission as Accompaniment. We are called to walk with Palestinian Christians in their daily struggles and in their celebrations, in their joys and in their sorrows. 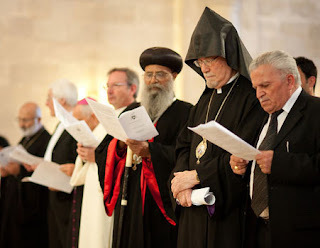 This walk occurs in an interfaith context seeking dialogue and respect among Jews and Muslims and in an ecumenical realm that seeks cooperation among Catholics, Orthodox, Armenians, and Protestants. The accompaniment model recognizes that accomplishments are no more important than relationships, that doing is no more important than being. Our daily walk in Jerusalem connects us with that great cloud of witnesses in a witness for peace.